The number one office solution for surveyors in the U.S.
As the number one office solution for surveyors in the U.S., newly released Carlson Survey 2016 continues its development of survey features based on customer requests. The versatile and popular surveying software solution works like a surveyor thinks. Highlights in the new release includes an added method to calculate a best-fit 3D line; improved cut sheet report with added functions to set and modify values for elevation, station, and offset, plus added method to import from TDS raw data; added method to renumber coordinates by adding prefix or suffix to point numbers; and for Deed Correlation, added method using polylines for input instead of points. 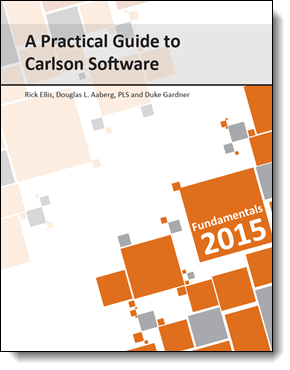 Carlson Survey’s 2016 version provides support for AutoCAD® 2016 and also works on AutoCAD versions 2010 and up; and runs in conjuction with Carlson’s robust civil engineering solution, the Civil Suite. All Carlson 2016 office software comes with the improved IntelliCAD® 8.1 built-in, which offers a CAD platform for no extra expense. Recently released, IntelliCAD 8.1 represents major improvements in its CAD engine technology, now including support for Microsoft Windows 10 along with multi-core processing when opening and regenerating files, which provides a 1.5 to 3 times performance improvement on multi-core computers. Carlson Survey is designed for use for land surveying. It provides a full tool kit for surveyors with everything from network least squares to surface modeling. Users get the ability to work seamlessly between the office and the field and they can establish company-wide design styles to ease and speed their work.